The plant started to operate less frequently, its capacity factor dropping from 85 percent in 2007 to a paltry 16 percent in 2012. Dominion put the plant up for sale last year and early this year announced that Energy Capital Partners would buy it. The firm, which owns other gas-fired plants in Massachusetts, agreed to pay Dominion $650 million for Brayton Point and two power plants in Illinois. Brayton Point had once been valued at a half-billion dollars, said Schlissel. He estimated the plant’s value as part of the deal at closer to a tenth of that figure. “This was buy one, get one free,” he said. The story indicates the huge, and questionable, expense of Dalton McGuinty's failed attempt to phase out coal in Ontario by 2007 - but the eventual success by the 2015 date set during the preceding Progressive Conservative government's reign. While Ontario has paid close to $200,000 per megawatt-year to lure natural gas-fired capacity to replace coal-fired plants, cheap gas made coal plants uneconomical. Brayton's Point's capacity factor, a "paltry 16 percent in 2012," was better than Ontario's coal-fired fleet achieved, with the exception of Lambton (which I estimate has been operating at a capacity factor between 25 and 30% the past couple of years). Non-fuel operating & maintenance costs for a coal plant are shown by the U.S. Energy Information Administration at roughly twice to same costs for a generator fired by natural gas, so infrequently utilized plants are generally fired on gas, or oil. If coal had been phased out economically in Ontario, the higher market prices now in New England would have occurred - but far higher prices are occurring in Ontario due to all of the contracts preventing the market from functioning. New England is facing another issue this winter - one of supply bottlenecks as it's power production moves increasingly to natural gas. The Federal Energy Regulatory Commission (FERC) has delivered a winter 2013-2014 assessment that deals extensively with supply issues in New England. 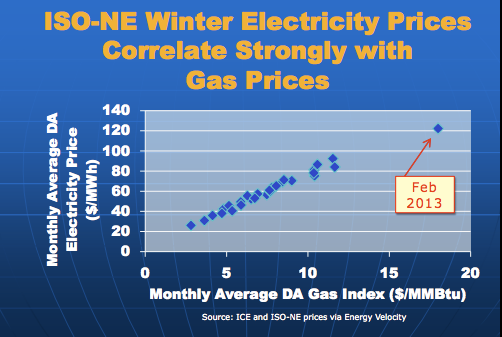 The market is now characterized by a very strong correlation between natural gas pricing and electricity pricing. Last year power plants had problems procuring natural gas during cold periods when the fuel also supplied heating. Liquid Natural Gas (LNG) has provided supply in the past, but is problematic both because it is priced globally and is not required often enough to maintain a supply chain ensuring the product is available when required. One LNG import terminal, Maryland's Cove Point, recently received approvals to switch over to exporting LNG. FERC notes changes to market structures, and insignificant loss of generation capacity, for the upcoming winter will limit the consequences of tight gas supply capacity to the higher pricing already seen in the futures market. 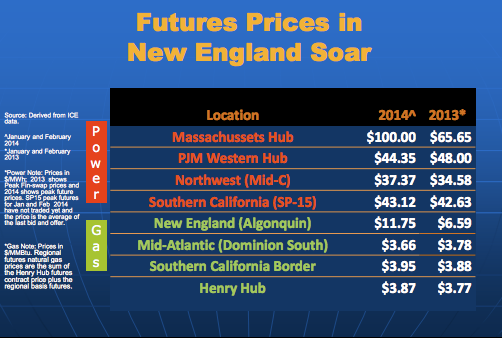 The loss of Vermont Yankee next year, and coal plants also in the near future, are probably leading to some expensive days for New Englanders - which won't much worry Hydro Quebec (or NB Power). 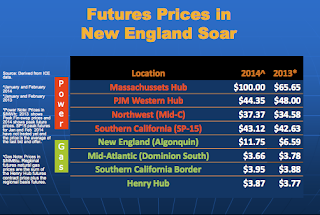 Will higher price events in New England be a precursor of things to come elsewhere? I wouldn't bet against the Koch brothers buying into generation, in the rough Texas market, signalling a bottom for electricity prices.